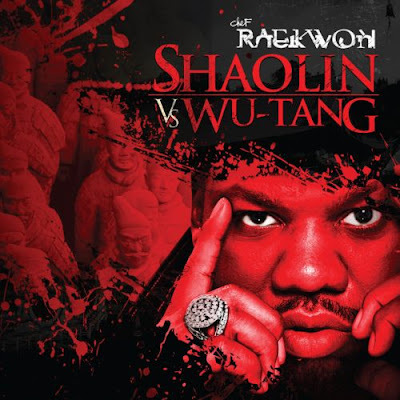 Straight from the slums of Shaolin, Raekwon the Chef has cooked up another eclectic stew of pop culture references and old school NYC street wisdom with Shaolin vs. Wu-Tang. Named after the classic chopsocky, Raekwon’s latest is the follow up to the surprisingly well received Only Built 4 Cuban Linx... Pt. II. In following up the original Cuban Linx, Rae suffered horribly from a severe case of the sophomore slump. Is Shaolin vs. Wu-Tang an epic blunder on par with 1999’s Immobilarity, or is it able to match the quality of its immediate predecessor? The album opens with the title track. Scram Jones supplies Raekwon with desperate violins that are ushered along by pulse-pounding drums. The accompanying high-hats sound like air pressure being emitted from a giant steam engine. Here, Rae’s voice and delivery almost have a “smoothing out” effect, as everything else about the song is frantic and loud. "Chop Chop Ninja" showcases Rae’s incredibly detailed storytelling. Inspectah Deck issues an equally detailed warning to any and all opponents. The light keys far off in the background bring to mind the synthesized score of Shogun Assassin. Bronze Nazareth provides ample chopsocky ambience on “Butter Knives.” The cloudy violin sample is adequately melodramatic. It sounds as though it could have been lifted from the De Wolfe music library (the same source that provided the musical backing for countless Shaw Brothers martial arts films). Content-wise it’s Rae’s usual confection of bravado and slang, but here it feels a touch more apocalyptic. Producer Selasi’s “Snake Pond” could easily be used to score a martial arts film. Whiny strings whittle away like the incessant buzzing of a mosquito while the foreboding bassline casts an impenetrable shadow. Raekwon again indulges his skill for detailed storytelling. This aesthetic is repeated on the amusingly titled “Crane Style,” albeit with a middle-eastern flare. Bongos bubble and pop like water gradually rising to a boil. Snake charmer flutes mill and seethe through the track like worms. The contrast between Rae’s conversational flow and Busta Rhymes animated yet precise rambling gives the track a nice balance. DJ Khalil offers what is perhaps the albums most “marketable” track with “Rock ‘N Roll.” The cross pollination between Wu-tang and Dipset that began on "Handcuffin' Them Hoes" continues here. Jim Jones’s cartoonish yet shallow swagger closes out the song. He does a serviceable job, though he is easily outclassed by Rae and Ghost. “Rich & Black” features the self-proclaimed prophet of Raps second golden era, Nas. Violins, crashing cymbals, and tambourines create an opaque curtain of sound. Though Rae and Nas both have distinct styles, they seem to blend together here in a symbiotic fashion. "From the Hills" is a Shaolin Rallying cry that pairs Rae with Method Man. Majestic horns give the track a vast and epic feel, as if it’s relaying a message from the mountaintops. Raheem Devaughn does a Curtis Mayfield impression that suits the mood. “Last Trip to Scotland” continues the cinematic theme that runs through the album. The standing bass and horns sound lifted from an old detective movie. Lloyd Banks adds his trademark sedate vocals, his voice cracking like a preteen caught in the throws of puberty. Again, a pairing that reads as somewhat weird on the track listing proves successful. The Alchemist lends his sonic talents to “Ferry Boat Killas.” It’s reminiscent of Lalo Schifrin’s score for Enter The Dragon, sans the funk and with a more drama. Mathematics steps behind the mixing boards for “Dart School.” Elegant harpsichord strings build to a crescendo alongside steadily escalating horns. The track feels light as air and glides along, using Rae’s flow as its compass. “Molasses” teams Rae and Ghost with Rick Ross. It incorporates elements of "Trouble, Heartaches & Sadness" by Ann Peebles. True students of Shaolin will recognize it as the same sample used on "Shadowboxin'." Ross, usually accompanied by lush production, adapts beautifully without forsaking his own style. “Masters of Our Fate” pairs Raekwon with verbal marksman Black Thought. The affecting violins and mournful choral singing are simultaneously uplifting and saddening. Raekwon will likely never record another LP as amazing and cohesive as the original Cuban Linx. However, he has mastered the one element that eluded him in the early part of his solo career: consistency. Whereas Immobilarity was a massive step down in quality from the original Cuban Linx, Shaolin vs. Wu-Tang is easily on par with Cuban Linx II. None of the guest stars upstage the main attraction, whose personality informs every moment of the proceedings. Though The RZA is absent this go round, the template he set is still firmly in place. The Wu-tang brand lives on, and is no longer solely dependent on the Wally Champ to keep it relevant. Score one more for the Shaolin crew. The Shaw Brothers Saturday Matinee: Vengeance!